Radio telescopes now in operation or under construction will be indispensible to scientists wrestling with the big, unanswered questions of 21st-Century astrophysics. That was the conclusion of a wide-ranging scientific meeting held in Charlottesville, Virginia, June 18-21, to mark the 50th anniversary of the National Radio Astronomy Observatory (NRAO). 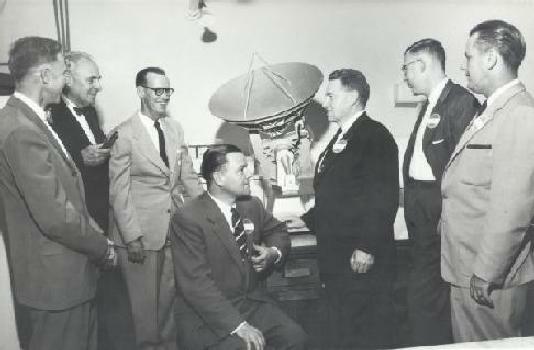 Dedication of NRAO, 17 October 1957. N.L. Ashton, D.S. Heeschen, H. Hockenberry. 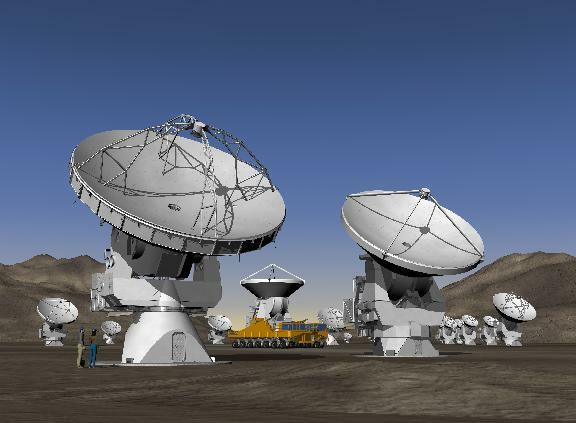 Artist's conception of completed ALMA. Nearly 200 scientists from around the world heard presentations about the frontiers of astrophysics and how the challenges at those frontiers will be met. In specialties as disparate as seeking the nature of the mysterious Dark Energy that is speeding the Universe's expansion to unraveling the details of how stars and planets are formed, more than 70 presenters looked toward future research breakthroughs. "NRAO's telescopes have made landmark contributions to the vast explosion of astronomical knowledge of the past half- century, and we look eagerly to making even more important contributions in the coming decades," said Fred K.Y. Lo, NRAO's director. Over the four days of the meeting, discussions ranged from recollections of radio astronomy's pioneering days of vacuum-tube equipment and paper chart recorders to the design of telescopes that will produce amounts of data that will strain today's computers. Presenters pointed out that, in the coming decades, radio telescope observations will advance not only astronomy but also fields of basic physics such as gravitational radiation, particle physics, and the fundamental physical constants. "This meeting provided a great overview of where astrophysics stands today and where the challenges and opportunities of the future lie. We had a good mix of veterans from the early days of radio astronomy and the young researchers who will carry the science well into the observatory's next half-century," said NRAO astronomer Jim Condon, who organized the scientific program. In addition to the presentations, meeting participants got an in-depth tour of the NRAO Technology Center, where the observatory is developing and building state-of-the-art electronics for radio astronomy. A half-century ago, NRAO staffers were preparing to break ground for the observatory's first telescope at Green Bank, West Virginia. That telescope was dedicated the next year. It was followed by ever more capable telescopes, culminating in the Robert C. Byrd Green Bank Telescope, the largest fully-steerable dish antenna in the world. Work at Green Bank laid the technical foundation for the Very Large Array, near Socorro, New Mexico, which was dedicated in 1980. The continent-wide Very Long Baseline Array was dedicated in 1993. NRAO, along with partners in Europe and Japan, is constructing the Atacama Large Millimeter Array (ALMA) in northern Chile, a facility that will bring entirely new observing capabilities to the world's astronomers. ALMA is expected to provide the opportunity for major advances in the understanding of how stars and planets are formed, and to reveal some of the first stars and galaxies that formed in the early Universe, among other achievements.